A common concern for owners of irrigation systems is the discharge of water from the back flow preventer. There are two main reasons this will occur. A back flow preventer is a device that prevents water from your irrigation system from re-entering your domestic water source. It does this by maintaining a lower water pressure in the irrigation system than in the domestic water source. If the pressure in the irrigation system gets too high a relief valve on the back flow preventer will open and discharge water till the proper pressure is restored in the irrigation system and then close. 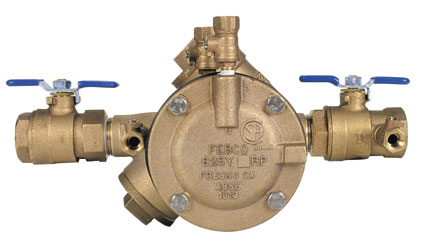 A persistent slow leaking from the back flow preventer is most commonly caused by debris such as dirt or sand from the domestic water source getting into the seat of the relief valve and keeping it from shutting all the way. This requires an irrigation service technician to take the relief valve apart and clean the valve seat. Often this is a recurring problem that results in repeat service call charges to maintain the system. In cases where this situation is a recurring problem, it is recommended that you have a filter installed on the domestic water source. The filter should be installed prior to the back flow preventer to eliminate debris from entering the relief valve. Copyright © 2019 Artistic Irrigation, LLC.